Welcome to the BSR Territorial Monitoring Tool! Welcome to the Baltic Sea Region Territorial Monitoring System. This interactive systems grants you access to a set of territorial monitoring indicators, subdivided into five domains. The chosen indicators highlight the performance of regions within the Baltic Sea Region, and compared to the ESPON space as a whole. 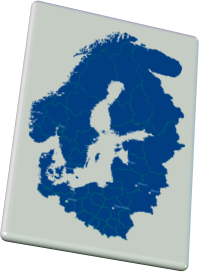 Enter the BSR section to familiarize yourself with spatial structures, transport infrastructures, with the administrative situation within the Baltic Sea Region, and to learn about the VASAB initiative. Inspect individual indicators via the Domains menu, navigate directly to a set of five most-important Headline indicators, visit the map gallery from the Gallery menu, or access a number of Applications representing analytical test beds for Baltic Sea Regions in Europe. In addition, the Baltic Sea Region Territorial Monitoring System pays specific attention to monitoring urban processes, accessable via the Cities menu. There, a total of 13 indicators may be explored grouped into five themes, illustrating the performance and development trends of 80 major cities in the Baltic Sea Region.